This page lists all reports that for Asia only that do not involve other countries. Click here for a list of all reports involving Asia. Volem a Leh, capital del Ladakh tibetà, des d'allà pedalar fins a Kargil, en zona musulmana molt a prop amb la conflictiva frontera amb Pakistan. Tornem a Leh amb taxi i agafar les bicicletes altre cop per arribar a Manali creuant colls de més de 5000 metres d'alçada. Escape from freezing Austrian Winter and drift like a thrift wood in waters of dead Sea. I found an little private room at Gil's Rooms at Newe Zohar. Located at the Southern end of the Dead Sea. You may find this place on Google maps. Samy, the owner has been very cooperative and helpful. He organized a shuttle from Tel Aviv Ben Gurion airport to Newe Zohar and back. Of course, there is a bicycle needed. I have taken my Brompton folding bike with me. Without, I would have been lost. Roads are good and not always flat. The landscape is beautiful. Riding in this depression of about 400 meters below Adriatic Sea level makes just fun. The area of Newe Zohar is save. Too far away from typical political quarrels in this part of the world. The Eastern side of Dead Sea is Jordan. The do the same: offering a high number of resort hotels to tourists. This ensures piece. All the hotel are occupied by Russian tourists. Russian language is the second language in that area. It always helped to start talks with "strastwuitje". My room has been somehow in the middle of nowhere. You should know, that Newe Zohar does not have a restaurant or a market. This is a place to relax. Made for Individualists like me. I am not unhappy as I was forced to pedal at least five kilometers in order to get a breakfast and shop daily needs. The hotel Lot coupon ensures an free entrance to the pool and beach. Bei den Emiraten und Oman kommen einen gleich Bilder von Sindbad und 1.001 Nacht in den Sinn, aber auch schier endlose heiße Wüsten. Kurzum eine perfekte Region, um sich Fahrrad und Zelt zu packen und auf den Weg zu machen. Our trip to Jordan took place in december 2009. We flew to Amman Airport, cycled to Madaba than to Dead Sea. Followed the road along the Dead Sea then to the highlands to Al Karak and continued to Dana National Park and the famous Petra. From there we travelled first to the desert, Wadi Rum, and after that to the Red Sea. With stunning scenery and dedicated bicycle paths, South Korea has some of the finest cycling. The '4 Rivers Bicycle Trails' project has given rise to an ever growing network of bicycle trails. With affordable accommodation and friendly Koreans, our cross country cycling experience was simply amazing. Questo itinerario mette in evidenza già da subito le difficoltà da affrontare sia in bicicletta che organizzativamente. Descrive pure la salita al passo Selim la parte più spettacolare del viaggio. This route highlights already suffered from the difficulties to be faced either by bike or organizationally. Also describes the ascent to Selim Pass, the most spectacular part of the trip. It was Friday on 14th February 2014, we had nice experience of Bicycle Touring. The cyclists were Me, Mr. Mujahid (Principal), Mr. Ahtasham (Vice Priincipal School), Mr. Imran Anjum and Mr. Khuram(Vice Principal college). We started our journey after Fajar prayer from Rabwah, had our break fast at 111 Pul, then continued the cycling towards Sargodha. From Sargodha, we moved further and stayed half an hour at Jhal Chakian and had their "Special Daal" in the meal at 12:00 pm. After having short stay we returned back. We covered 115 km in 10 hours and we returned safely at home while cycling on Sargodha and Faisalabad road.Allhamdolillah. If you followed reports from the ultralight cycle-touring page, than you know a certain Mr. Iik - a man with two distinctive features: he rides bicycles and he doesn't live in the town he was born. After touring for two consecutive years in a civilized manner in France, this year Mr. Iik opted for a more exotic ground: Vietnam and China. What was the motivation for such a tour, he now cannot fully recall, but the highly probable guess is that it was not to lose touch with "true" cycle touring - means adventure, cultural shock, cheap accommodation and food, stealth camping, self-sufficiency, suffering and that sort of thing. Prime impressioni e foto di un viaggio tutto da scrivere. First impressions and photos of a trip to be written. It's econom, not very difficult, nice route with 6 passes more 5000-5300 m.
"Oh, oh, Lütte, das sieht gar nicht gut aus! ", hatte ich meiner Freundin zugerufen, als sie vor mir fahrend versuchte, einen Bergpass von 3200 Meter Höhe mit einer Geschwindigkeit von 0,3 km/h zu erklimmen. Central Asia attracted with its gigantic mountains and secluded paths that I wanted to experience as much as possible. With my "Yak", which I bought six years ago at a bazaar in Mongolia, I spent six weeks in the Tian Shan in the Pamirs of Kyrgyzstan and Tajikistan. Rather unplanned I chosed a few times connecting paths that turned out to be animal and equestrian trails. But finally these sections were the most impressive of the entire trip... A continuation of the journey through the Pamirs was not possible because previous fights in Khorog resulted in the temporary closure of the Gorno-Badakhshan region. Merely a detour towards Kalaikhum I was able to try. Ho sempre desiderato viaggiare con la bicicletta da solo. Ho deciso di farlo durante le vacanze del nuovo anno 2013 e come slogan ho messo due avvisi sulla bicicletta a favore Mahak Charity e il viaggio è iniziato. Sono website designer, ma mi dichiaro un esploratore, avventuriero. Ho eseguito corsi di sopravvivenza, sono cintura nera di Taekwondo, e guida naturalistic e di, sopravvivenza in territori ostili e jungla, frequento scalate in climbing e amo molto la MTB. Relaxed nearly 900 km journey along the coast of Gulf of Thailand and Andaman sea with many beaches. A lot of pleasure with cycling, swimming and sunbathing. We are two Indian cyclists rediscovering our own country through a 9000 km journey through the heart of India. We are 2 Indians who have decided to hit the road on our cycles and rediscover our country slowly but surely. This is our first ever touring trip together and we ride into this quite unprepared, but we are learning with every hour that passes and we are loving it even more with every minute on the road. We have just about started and it has already been an overwhelming ride. With 5 months more to go, we can't wait to expect everything that road is going to spring upon us. It's hard to describe the feeling when you're just about to start an extended overland trip - it's even harder to describe the feeling when that trip is about to end, but the end of one trip however means that you are that little bit closer to the beginning of the next adventure. We completed our 1st overland trip after 545 days on the road, traveling just over 70,000km and crossing 35 countries. Our 2nd trip was always going to happen, it was just a matter of deciding how, when and where and after a lot of deliberation we finally decided on the next adventure. Some people think it's a bit extreme when comparing it to our trip from Oz to Cape Town, but what would life really be like without a bit of adventure and challenges. After all, we are all here to live life...! A bicycle! Yes, that's right, a bicycle!! We are hoping to cover about 20,000 km over a planned 12 month period starting in Indonesia, heading north from there through SE Asia into southern China before making a u-turn to go south once again through Vietnam before hopping onto a plane to continue in India to finally reach Nepal. on this five day tour, we visited the lumbini complex near the indo-nepal border at bhairahawa, the lovely hill town of tansen, pokhara and its hidden seti river gorge, water rafting from fisling and then cycled from the end of the water rafting to the river city of narayanghat. on the last day, we toured chitwan national park (outer area only) in the morning, and then drove back to kanpur. A ride in Kurdistan, involving bad weather, great hospitality and harrowing stories. Cycling Japan was my first journey on a bicycle. Outside the big cities, Japan is indeed a great country to cycle on low budget with heaps of free camping opportunities, great and affordable food and no absolutely tourist scam. The helpful and kind Japanese contributed so much to my experience. A few word of Japanese do make a difference. We are a couple of young italian travellers and we are riding through South-East of Asia, exploring the area also by hiking and trying to know local traditions and cultures. From Bangkok, we went to northern Thailand in about two months reaching the area of the Golden Triangle. 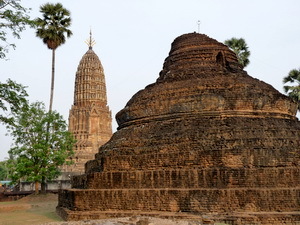 Now we are in Laos and our travel goes on...We are planning to go to Cambodia and Vietnam next months... Follow us on our frequently updated website! Wir wollten von Chiang Mai nach Süden Radeln, was uns wegen der ungewöhnlich großen Hitze nicht gelungen ist. Es war trotzdem eine schöne Reise. We're Emma and Justin, two New Zealanders who have 'gone cycling' after six years working and living in London. We talked about the possibility of a big trip quietly at first. We were on a train in England somewhere and we sketched a rudimentary map which plotted our way towards Russia. Our cycling trips became more ambitious, and we tested our enthusiasm for the idea by cycling the length of the UK (Lands End to John O'Groats) over three weeks in 2009. After 6 years living away from New Zealand we decided it was time to pack up London lives, quit jobs and go. We have been on the road since March 2010 and intend to reach the edge of Asia by March 2012. Our website documents some of the places we've discovered on our travels. My plan is simple: ride as long as it is fun! In July 2007 I closed the door behind me to start my first trike tour. I had no idea how far I would get and this tour took me from Canada to Guatemala. I had such a good time I continued on spending 9 months cycling New Zealand and Australia. In 2009 I cycled through Vietnam, Laos, Cambodia and Thailand. Quest for the celebration of 31 December and the New Year in the village. This trip was as usual in the India-Bangladesh border of Sylhet Division. But this time the mission was to see how people celebrate 31 December and New Year in the village. Unfortunately I couldn't find any exception in their life then any other day of the year!! For them; every day starts with a fixed schedule. (laces visited: Jaintapur, Kanaighat, Jakiganaj, Biyanibazar, Boroleka, Kulawara, Komolganj, Srimongar, Shyastaganj, Chunarughat, Madhabpur. I was planning for a bicycle trip since April of this year. I am glad that finally I did make it. I started from Jaintapur, Sylhet and paddled up to Banglabandha, Tetuliya, Panchagar about 560kms. It took me 8 days to complete this trip. For me it was not just a cycle trip but also mastering my fear! I did this trip alone so that I can learn what it is after the fear. I took only the India-Bangladesh border road. And I have learned a lot. In the way I had to stay in the school veranda or sometime people gave me shelter in their house. I am thank full to all of them who have helped me to complete this trip. Hope you will like the pictures. Don't forget to leave your comment! Thanks, Sudipta. Nepal isn't just the Himalayas. Of course you have great views over the Himalayan mountain range while cycling from Kathmandu to Pokhara. Still what we most enjoyed was cycling through Nepal's medieval towns and across the Terai. 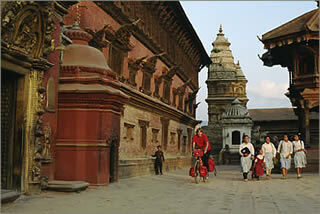 On our Cycling in Nepal website we show what it's like to travel through this ancient mountain kingdom. Cycling in Indonesia gave us a new definition to the word ``green''. Green is overwhelming, multi-hued and... tropical. So it also means, ``dreaming of a shower'' after a long (hot?) and humid cycling day. On our Cycling in Indonesia website we show what it's like to travel through this tropical country. Which country do we keep coming back to? India! For India's diverse people, landscapes and religions make it a fascinating land to bicycle through. On our Cycling in India website we show what it's like to travel through this enormous country. You will find a lot of photogaphs (``Bilder''), the mapped route (``Karte'') and informations about the route, day-km and travel costs (``Streckenprotokoll''). The tour report is written in German, but a collection of photographs (``Bilder''), the mapped route (``Karte'') and informations about the route, day-km and travel costs (``Streckenprotokoll'') are mostly self-explanatory. A six week ride mostly around the Tajik Pamir. Fantastic high altitude scenery, wonderful people and unspeakable food. Highlight was the rarely visited Bartang Valley. On Russian iceroads, the so-called ``zimniks'', I cycled in march 2008 three weeks along the frozen Ob-river. The trip started in Priobe (Chanty-Mansijskij district) and ended in the mountains of Polar Ural near Salekhard above the arctic circle (Jamalo-Neneckij district). At the beginning I had no knowledge about the exactly road course, because it isn't shown on maps. I also had no special winter clothes, but no really critical situations in coldness (-37°C minimum). This bike trip was an great adventure with breathtaking impressions of Siberian winter and some meetings with the Chanty, the natives of northern Ob-region. The tour report is written in german, but a collection of photogaphs (``Bilder''), the mapped route (``Karte'') and informations about the route, day-km, weather and travel costs (``Streckenprotokoll'') are self-explanatory. Where the Heck is Sulawesi? I've cycled in Indonesia numerous times on the islands of Raiu, Java, Bali, and Lombok. I love Bali and have been there a half dozen times. Bali is a small island so cycling is somewhat limited, but I still find myself going back again and again. I stumbled upon a magazine article about an Australian who did a bicycle tour on Sulawesi, and that peeked my interest. I did some research and decided to travel there and take a look. Sulawesi is considered an exotic destination and therefore attracts a number of foreign tourists. The climate is warm there, much warmer than the usual winter temperatures in Northern California. The winter of '08/'09 through January anyway, has been very dry and not near as cold as past winters. My bike ride in Sulawesi will take 23 days, a couple of which I will spend in wonderful Bali before flying on to that island. I invite you to come along with me as I visit the sights to be seen in Sulawesi. Summer has almost arrived here in California. The weather in May is nice and I should be happy to be comfortable at home and to cyle around the area where I live, but I get restless and bored with the same scenery and that is my problem. I haven't been on a multi-day bike tour since I cycled in Sulawesi, Indonesia, in March and I've had no additional tour plans until July, when I've penciled out a ride in Europe. What to do during the three month intern is the question. I love cycling and especially riding in my favorite county, Thailand, so why not return for one more ride. I've never cycled there in May though, and with good reason, as it rains a lot. The 'wet season' extends from April thru early November. The weather in May and June, when I will be there will be hot, 90 to 100+ degrees, and wet. I just hope it doesn't rain all day every day. My experience cycling there at other times of the year is that it rains mostly in the afternoons and at night. If that is the case, I will have done the day's ride and be settled in a nice hotel room by late afternoon and the rains would not be so much of a bother. That is my hope. Trans Asia on a single speed bicycle with just a small backpack as luggage. The ultimate light weight experience. On Januari 10th we will start our Fixed & Free Challenge from Singapore. Cycling through Malaysia, Thailand, Cambodia, Laos, Vietnam and China we are aiming to arrive in Shanghai in May 2010. Already on our fully loaded expeditions we have been constantly minimising our gear and now we even go without gears. Although limited by our 25 litre backpacks we will carry more than enough for a journey like this including a Macbook and camera each.